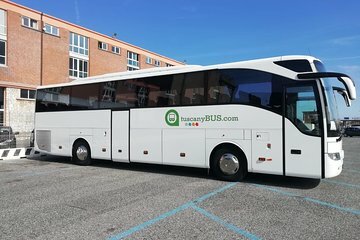 Los pasajeros de cruceros pueden disfrutar cómodamente de una visita a Florencia y Pisa en un día con viaje de ida y vuelta en autobús desde Livorno. Con punto de recogida en el puerto de Livorno, disfrutará de aire acondicionado y conexión Wi-Fi gratis durante todo el viaje. Pase tres horas y media explorando Florencia por su cuenta y visitando los lugares que más le interesen. Más tarde, pase una hora completa disfrutando de la Piazza dei Miracoli, antes de regresar a su barco. Disfruta del aire acondicionado y wifi gratis en el autocar. Visitar Pisa y Florencia en un día. This is a good option for cruisers. You do have to pay for a shuttle at the cruise port to get to the viator shuttle bus ( I think it was around 5 euro pp for us). Wifi wasn't the best on the bus. Instructions were clear about where to meet the bus again. On our bus they waited for people that were late and tried to contact them but I've read other reviews where they left if you were late. So it's best to be early to the bus. Overall, good simple transfer service. We took the shuttle from the port into downtown where we met the transfer bus. Everything went smoothly and arrived in Florence early enough. We had bought tickets for the Academia so we were able to bypass the long lines which was great. We spent only about 1 1/4 hours in Pisa but that was good enough as everything to see was centered in the same area. We got back to the ship in time for our sailing. 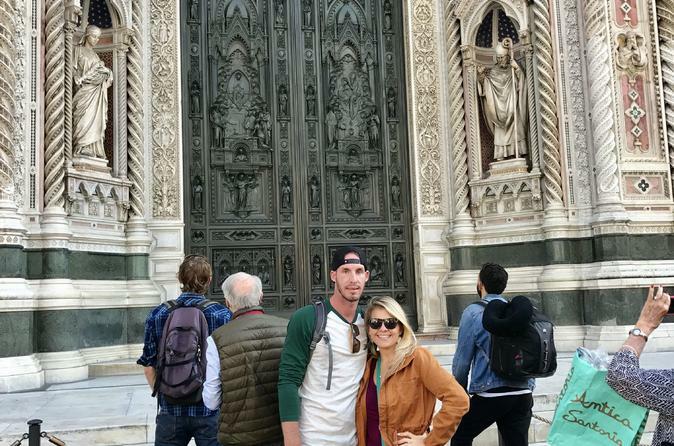 Our day in Florence and Pisa was absolutely incredible. From the easy ability to find our bus to the amount of time spent in each area, we were able to see so much of both cities. Viator really helped make our vacation memories ones that will last a lifetime. It's a bus ride to Florence and then onto Pisa. There was no added value here from the driver or coordinating person on board. I would recommend skipping Pisa. It's a tourist trap that has no personality. Florence was spectacular but finding the bus for the return ride was challenging. Our trip to Florence and Pisa were good. Particularly the guide on the bus has been excellent, very friendly and helpful. Recommend to my fellow travelers. One advice : would have been better if the gathering point and details could have been made clearer. This tour was largely just bus transportation to Florence and Pisa from cruise dock, which was exactly as advertised. We were satisfied with what we got. The time was well managed and drive and tour guide were courteous and provided maps and good and clear information. The only small issue we had was with the instruction on the voucher - it was not clear that one had to take the cruise line’s free shuttle into Livorno first and then get on this tour. We thought the tour would leave directly from cruise dock. But once that was figured out, it was exactly as advertised. The price is very fair and a good deal. The pick up point was poorly described and made it difficult to find adding unnecessary stress on vacation. Our poorly groomed bus tour guide had very poor English. We could hardly understand what she was saying. There was very little information given about Florence or Piza. There is such a rich history and so much to see in Florence. Yet there was very little information given,. Boring ride. Save your money for a real tour guide in Florence and get your own transportation. The pickup location was not made clear to us. No body held the sign to pick us up when we went out the cruise terminal. We had to rent a taxi to rush to Florence and Pisa because we had booked two museums visit. Good way to get to/from Florence/Pisa especially when on a cruise. The tour guide on the bus was very helpful, informative and kept the gypsies from haggling us on the walk to/from the leaning tower of Pisa. We enjoyed Florence as well. First, be prepared to pay to get to this bus from the cruise port. Thought we'd be picked up at the ship. Not so. Then, once on the tour bus the Guide asked for our phone number incase of problems, but did not even try to contact us nor another couple who could not find the bus in Florence. After not even 5 min, just left without us. We tried to call her, but call wouldn't go through. Never thought they would leave us behind without at least trying to call to see why we were not at the bus at departure time. Why ask for our number? Other guide from same company called her and she refused to come back for us, even though it was only 5 min after departure time. We never got to see Pisa.